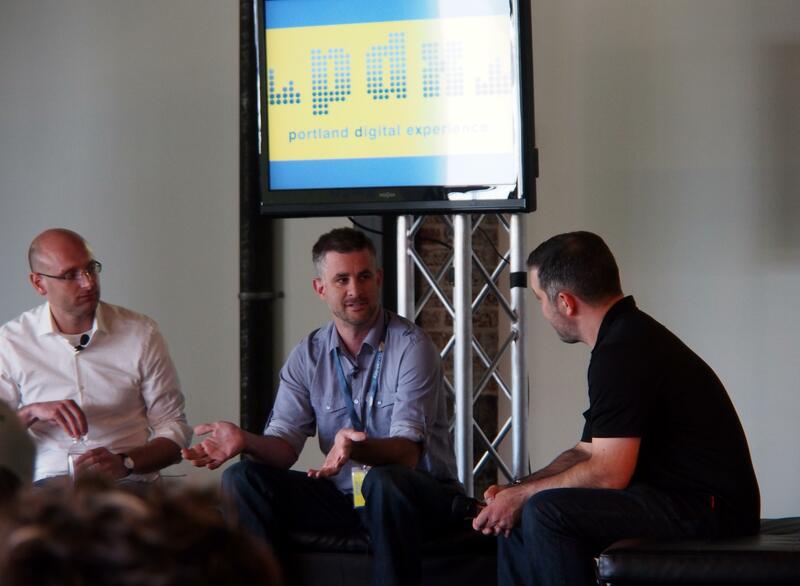 A hot topic at Portland Digital eXperience has been traditional industry disruption — and what old market doesn’t fit the bill better than payments? The finance industry is chock-full of regulation, governmental bodies, and ancient attitudes. Suffice it to say there are hurdles. The CEO’s of Simple, a banking solution, and Chirpify, a Twitter payment client (you read that right) were on hand to talk about the evolution of digital finance, and how they’re helping to change it. The idea behind Simple: It’s a fully digital banking card and account, that includes a physical debit card accepted everywhere Visa is accepted. Simple believes its customer service and attention to detail, along with its mobile-friendly tracking and payments system, are its biggest assets. Chirpify’s stab at uncomplicating how we pay for things is less calculated, although it’s had a huge early impact. The concept: Connect your Twitter and Paypal accounts using Chirpify, and then use the integrated service to @ pay connections. Shocked people would do that? You’re not the only one. “The first surprise with Chirpify was that people wanted to use it at all… to pay for something with a tweet online,” said founder Chris Teso. But clearly, the masses approve. During this past SXSW, Chirpify got its API wrapped and ready for a tweet-a-beer promotion, where Chirpify users could buy a beer for their Twitter contacts at certain locations in Austin. And the viral nature of online — very, very public — payments has only helped Chirpify’s usage spread. “There’s a pretty high conversion rate when you get a tweet saying ‘someone sent you money, come here and sign up to claim,” said Teso. For its part, Chirpify hasn’t had to go its own road — yet. For now, the service piggybacks off of Twitter and Paypal, the latter of which being a service which Teso mentions gets and deserves plenty of user ire. Not for long, though; he says that Chirpify plans to go it alone, launching its own payment service within the application and cutting out the middle man. For its part, Simple would like to add business banking support (it’s focused on individual usage at the moment) — something that will require a great many hoops to jump through, regulation-wise. Combining tech and money is a tough sell, and the road ahead is paved with plenty of potholes. But the outlook is bright: Both Simple and Chirpify have launched alternative payment platforms that five years ago would have sounded impossible — and people are buying into it quickly. Blame it on distrust or frustration or trust in tech… whatever is happening, it’s clear users are increasingly comfortable with new and innovative solutions when it comes to handling their money.